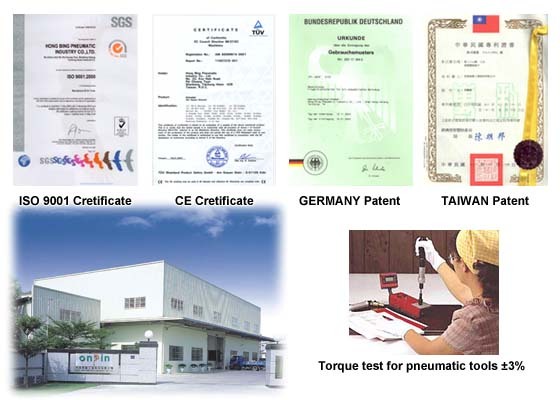 Established in 1974, Hong Bing Pneumatic Industry Co., Ltd. has been insisting on the level as a professional manufacturer. HONG BING is able to supply your needs from the basic pneumatic screwdrivers to the most professional robotic arm pneumatic tools. HONG BING has been approved by ISO 9001(SGS) and CE (TUV). HONG BING has gathered over 30 years experience of R&D and Q.C., while engaging in innovative and stabilizing quality. On production facility, we use automatic and semi-automatic CNC, and strictly manufacturing key spare parts. It will increase the good rate and accurate. HONG BING is your best choice for industrial applications of pneumatic tools.